We’ve had a rainy week, as we sometimes do. Not a 100-year rain, not a 50-year rain, not even a 25-year rain. Just a normal rainy week, with normal thunderstorms. And, not surprisingly, when pipeline companies try do work on steep terrain, the slopes slide. 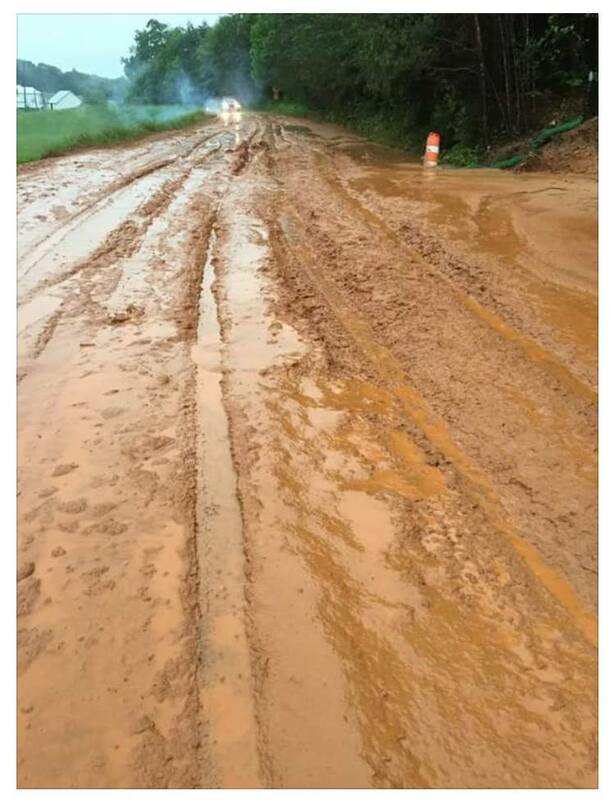 On May 18, 2018, Cahas Mountain Rd in Franklin County was covered in sediment after tree clearing by Mountain Valley Pipeline crews. Locals on the scene say the mud was 12” to 18” thick. The road was closed. The nearby creek was running red. The mud blocked traffic, rerouted school-buses and put the lives, land and water of Franklin County citizens at risk. Sediment-laden runoff filled local creeks to the point where cattle would not drink from them. Environmental experts and concerned citizens have – since 2014 – been telling FERC, the Virginia Department of Environmental Quality, and the Governor of Virginia that this kind of destruction will be the result of both Mountain Valley and Atlantic Coast Pipeline construction on our steep mountain slopes. We also suggest you contact your local government officials and insist that they report this to the officials responsible (such as the DEQ, VDOT, etc) for monitoring and compliance. And here in Nelson County, Richard Averitt made this quick video to show the effects of the rain in Nelson County. We are facing an unprecedented risk to our communities. Please help. Look at the sediment problems from this one normal spring rain along the mountain valley pipeline route and imagine that same thing here in our communities and hundreds of communities throughout our state. This entry was posted in Citizen Surveillance, Construction, DEQ, Environmental Impact, Natural Resources, Steep Slopes, Take Action, Videos, Water Quality on May 19, 2018 by Ellen Bouton.